Kim was already training in a manner of speaking. Between his first and second operation, Kim’s father would oversee his physical therapy. After the second operation his therapy included weight training, jogging, jumping rope, and judo. All of this was under the watchful and protective eye of his father. But he felt that he needed more. After long deliberations with himself, Kim decided to train in the martial arts. He went to the local gym and presented himself to Headmaster Lee Byung Ro, and asked if he could train. “Master Lee’s face lit up with a kind smile and told me that if I am so determined, than no handicap can be a handicap. “The young boy felt a fire surge through him, a life, a renewed spirit. There was something special in this gym. 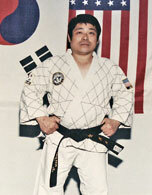 Under Lee Byung Ro’s master, Grandmaster Jong Woo Lee, that gym was to become the Jido Kwan. 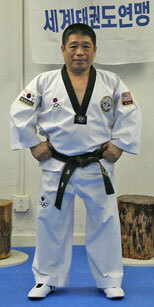 Kim registered, got his dobok, and walked onto the training floor. Suddenly doubt pierced him again as he watched the others go the drills. To him they were all powerful looking, possessing perfect bodies and executing flawless techniques. He felt self-conscious about his ridiculous physique and debated if he should turn around and leave. Fortunately, one of the instructors noticed him standing there, holding his uniform. The instructor yelled, ordering him to change into the dobok and get onto the floor. “At this, I pulled my courage and followed him without the slightest hesitation. “Training in Korea in those days was very different from training today. The beginner students could possibly spend months just doing chores such as cleaning the floor on your hands and knees “for mental strength.” Kim would do his chores, watching the advanced students train and later, at home, he would try to emulate them. Those first days were very difficult. Though he went through an intense physical therapy, this was very different. He had to learn how to maneuver his limbs that had been stiffened by so many years of pain and inactivity. The training was quite painful for him. But with a fire and determination few of us will ever hope to comprehend, the young man continued with his training. “As soon as I finished with (academic) classes, I ran to the gym and devoted all my energy and concentration on following (my) Tae Kwon Do instructors. “Kim had just received his yellow belt when an instructor told him that he would probably quit before he received his blue belt. This hurt him very much. The old angers and frustrations began to swell once again. He felt as if he were going to explode. But he calmed himself. This may not have been “blind prejudice” because of his deformity; there may be some validity to those words. To say that those words added more fuel to Kim’s fire of determination and persistence would be an understatement. He trained even harder. After finishing his school work, he practiced Tae Kwon Do until about two in the morning. With his deformed body, Kim knew he had to run harder and longer, lift more weights; wake up earlier and train harder than anyone else. He would even stay after training and listen to the instructors tell their stories, hoping to pick up some more training tips. He trained throughout the year; the weather did not stop him. Often during the winter, he would get frost bite from training in his bare feet on the unheated floor. During the summer he would practically be washed in sweat. So much sweat that after training he would have to mop the floors. Kim trained and trained and trained. 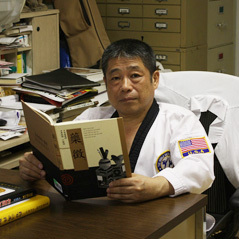 Whenever he felt as though he would collapse the instructors would encourage him, telling him to “Keep doing what he was doing.” As he started to advance, the senior students would challenge him: “A challenge was when a higher belt would select to train with a lower belt. This training would often look like full contact matches… Tae Kwon Do at this time was not a sport. It was a martial art. “In those challenges he was often beaten badly and even knocked out: “I got broken fingers, (hurt) my legs… Many times I was rushed to the doctor’s house in emergency which would send my family into panic! My mother pleaded with me to stop training. But I couldn’t. I could not possibly allow (defeat) to my only hope (a future in Tae Kwon Do)!” Finally after years of sweat, sacrifice and blood, Kyung Sup Kim received his black belt.”The feeling of contentment and pleasure was beyond words. I felt as if I were walking on clouds. I began to see daybreak and a wide road to my future. However, I didn’t slow down my training. I wanted to set a good example to the new students. 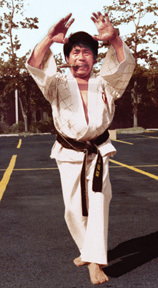 I wanted to perfect my skills… and my image as an accomplished (black belt) with continuous exercise and training. I closely watched my seniors perfect their skills and their techniques. I kept repeating their movements over and over again, until I reached their level of grace and perfection. If it wasn’t (accomplished) in days, I did it in weeks; if not weeks, than I did it in months. Before I knew it, I was given the (grade) of master!” While Master Kim was training, his efforts were far from being unnoticed. Stories about his courage and determination spread throughout Korea. When he received his black belt it got attention. Kyung Sup Kim, virtually, was the equivalent of a Korean Helen Keller; having overcome tremendous odds and traumatic experiences by sheer will and determination. Master Kim was a Judge for the World Tae Kwon Do Federation (WTF) tournaments and the chief instructor for the new forms. He would teach, then test all WTF members who wanted to teach outside Korea, insuring that they were all doing the same forms and techniques. He was also responsible for teaching the Taeguk forms. 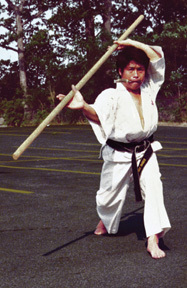 Master Kim came to Syracuse, New York, in 1978 and worked his way down state to New York City where he owns and operates the SMS Tae Kwon Do School. If you observe him teaching a class or even walking down the street, it is easy to forget his deformity. He is short in height, but with his inner strength, his warmth and love for his students and Tae Kwon Do; you feel as if you are walking with a giant.